We’d love your help. Let us know what’s wrong with this preview of Make 'Em Laugh & Take Their Money by Dan S. Kennedy. People buy more and buy more happily when in good humor. 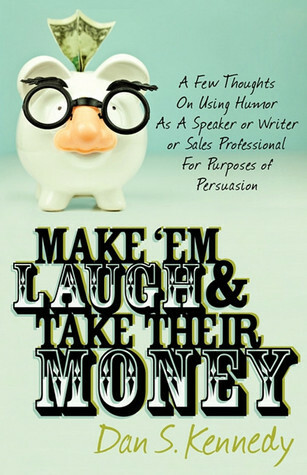 Understanding humor and being able to effectively use it for your sales and persuasion purposes is a powerful advantage--for any speaker, salesman or writer." Drawn from 30 years' experience as a popular professional speaker, author of 13 books, columnist and advertising copywriter, Dan Kennedy looks at humor as an i People buy more and buy more happily when in good humor. Understanding humor and being able to effectively use it for your sales and persuasion purposes is a powerful advantage--for any speaker, salesman or writer." Drawn from 30 years' experience as a popular professional speaker, author of 13 books, columnist and advertising copywriter, Dan Kennedy looks at humor as an instrument of persuasion and influence. Anyone--amateur--or pro--who must stand and deliver speeches, seminars, group sales presentations, serve as toastmaster, or write advertisements, sales letters or newsletters will find fodder here, to be faster on their feet, more confident and adept at being funny with a purpose. The book contains thoughtful insight but also simple shortcuts. Reading it, you'll get a better appreciation for the humor around you and humor professionals who entertain you, and you’ll exit stage left with humor strategies and tricks you can use. Even if you're not all that funny. Note: this book contains adult material and may not be suitable for minors. Or for the easily offended. To ask other readers questions about Make 'Em Laugh & Take Their Money, please sign up. Only reason I got this book is because am a fans other work - primarily in marketing and business - this book was 'ok' with not too much focused on marketing , but I do get the idea of using humour to connect with your audience which can most definitely be applying to a sales situations - I like to be chilled and enjoy using humour in my life regularly , but I kinda change in marketing situations or don't express myself as well - this book had some mugged to remind how to be myself more which is Only reason I got this book is because am a fans other work - primarily in marketing and business - this book was 'ok' with not too much focused on marketing , but I do get the idea of using humour to connect with your audience which can most definitely be applying to a sales situations - I like to be chilled and enjoy using humour in my life regularly , but I kinda change in marketing situations or don't express myself as well - this book had some mugged to remind how to be myself more which is naturally a funny guy - and although the primary focus of this book wasn't teaching much marketing I dd pick up some good nuggets how to communicate with my email newsletter subscribers more naturally with humour which is the the real me... So don't totally knock it! To Our Continued Successes 2cents :) ! Was different than I expected and wanted it to be. Thought Dan Kennedy was funny and had some funny concepts but I'm not looking to be a standup comedian and felt like this book was teaching me how. Simply wanted some ideas on using humor in sales situations and found it lacking. Why it is important to use jokes and gags in your presentations to make your buyers perceive you as a friend. Funny and great read on how to persuade clients and how to get trust by being funny/sarcastic/etc. Dan S. Kennedy is the provocative, truth-telling author of seven popular No B.S. books, thirteen business books total; a serial, successful, multi-millionaire entrepreneur; trusted marketing advisor, consultant and coach to hundreds of private entrepreneurial clients running businesses from $1-million to $1-billion in size; and he influences well over 1-million independent business owners annually Dan S. Kennedy is the provocative, truth-telling author of seven popular No B.S. books, thirteen business books total; a serial, successful, multi-millionaire entrepreneur; trusted marketing advisor, consultant and coach to hundreds of private entrepreneurial clients running businesses from $1-million to $1-billion in size; and he influences well over 1-million independent business owners annually through his newsletters, tele-coaching programs, local Chapters and Kennedy Study Groups meeting in over 100 cities, and a network of top niched consultants in nearly 150 different business and industry categories and professions. As a speaker Dan has repeatedly appeared with four former U.S. Presidents; business celebrities like Donald Trump and Gene Simmons (KISS, Family Jewels on A&E); legendary entrepreneurs including Jim McCann (1-800-Flowers), Debbi Fields (Mrs. Fields Cookies), and Nido Qubein (Great Harvest Bread Co.); famous business speakers including Zig Ziglar, Brian Tracy, Jim Rohn, Tom Hopkins, and Tony Robbins and countless sports and Hollywood celebrities. Dan has addressed audiences as large as 35,000....for more than ten consecutive years, he averaged speaking to more than 250,000 people per year. Corporate engagements have included American Honda, Floor Coverings International, IBM, Pitney-Bowes, Sun Securities. Today, Dan rarely accepts speaking engagements outside of Glazer-Kennedy Insider's Circle ™ events. As a direct-response marketing consultant and copywriter, Dan is the 'hidden genius' behind full-page magazine ads you read, TV infomercials you see, online marketing and direct-mail you receive. He is routinely paid upwards from $50,000.00 to, on average, $100,000.00 to $200,000.00 plus royalties to craft direct-response ads, sales letters, direct-mail campaigns and integrated offline/online marketing systems for his private clients.... over 85% of which repeat. His advertisements created for clients have appeared in over 200 magazines from industry trade journals, airline magazines and The Wall Street Journal to USA Today and Readers Digest to Cosmopolitan.